_Ypsilanti, Michigan was nothing like this. For that reason alone, Emily Miller knew the scene before her should have been perfect. Beyond the Basilica di Santa Maria della Salute, the sun faded from the sky. Streaks and splashes of orange, pink and red darkened and drained down into the sea. The water of the lagoon deepened to violet and then to indigo at the base of the dock – the Molo, she corrected herself – while the black-and-white striped shirts of the gondoliers glowed ghostlike over the sleek black boats drifting silently toward the Bridge of Sighs. The breeze off the water swept the fringe of short hair off her forehead and out of her eyes. Loose strands from her ponytail tickled and danced delicately along her neck. Her skin went gooseflesh for a moment in the cool air after the sunset, but it was a relief to have the baking heat of another July day over and done with. Now she could cease fanning herself, relax and watch the crowds from her seat here at the café with her friend, Jenn. A jumble of voices and a burst of laughter by the water drew her attention. Her gaze shifted to a group of young men and women laughing, chattering and playing along the edge of the Molo. She watched, smiling, as they feigned attempts to push one another into the water next to a cluster of docked gondolas. As the group came closer, she saw they were younger than she had first thought. They were teenagers, barely old enough to be out of school. One of the boys grabbed a girl by the hand and swung her wildly about, until, squealing with laughter, she teetered on the edge of the walkway. He pulled her back, put his arms around her and planted a kiss on her still-laughing mouth. For a moment, Emily fancied she could feel that same sort of kiss on her own lips. It hadn't been so long ago since Jason had kissed her that way, had it? A sense of guilty voyeurism swept over Emily before she looked away. She swallowed hard, her throat rasping with an aching familiarity. Breathing deep, she caught the salty tang of the lagoon, tinged with just a hint of something green – mold or even mildew, perhaps. Another, gentler breeze carried the scent of strong black coffee from a couple of tables over, making her mouth water for the bitter taste. It was all too beautiful. Too perfect. Too...Venice. A custom-ordered sunset, a cool breeze, beautiful people everywhere. Her imagination hadn't overhyped anything, after all. She wished that Jason would leave her thoughts long enough for her to enjoy it. If only he hadn't promised to bring her here. If only he hadn't promised to love her forever. If he'd only kept one promise – just one. Her hand settled briefly on her abdomen before she pulled it away. Twenty-five years old and she already felt like an old maid. Then she noticed the handsome blond stranger, in white linen, who stood with his back to the sunset. His gaze was focused on Emily's table. Or, rather, his gaze was focused on Jenn. It was only natural. She glanced down at her own plump figure, then over at Jenn's classic Nordic features. Not for the first time, Emily considered the fact her statuesque best friend was uncommonly attractive. Rather like the man who was watching Jenn now. Emily sighed, picked up her Bellini and took a cool, peach-infused sip. Jenn had insisted on ordering them although Emily didn't drink much alcohol. "And so, I manage to avoid even the charms of Venice," Emily mumbled, resolving to ignore her friend's admirer. 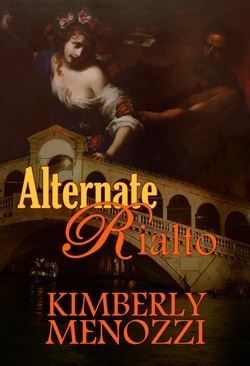 Jenn turned toward her, away from the passersby strolling along the Molo toward Piazza San Marco. "Come again?" Her long, elegant fingers pushed her sunglasses up to rest above her forehead. "Nothing, Sissy." Emily directed her gaze back to her drink, helpless to stop picturing the stranger. "I was just thinking aloud." "Do tell, Mouse." Jenn said. She leaned forward, gesturing with her free hand toward her friend's head. "What's going on in there?" Emily took another sip of her drink and turned to watch the blond stranger again. He was gone. "I guess I've just been a bit lost in my head. I keep thinking about…stuff." Jenn frowned, tilting her head to one side. "What's that? What are you thinking about? Jason?" "Yes, and no. I mean… Look." Emily put her drink down and faced her friend. "Two weeks we've been here. Rome, Pisa, Florence, and you've had a...boyfriend in every one of those towns, and I've had nothing. Nada. Zip. Zilch. Not so much as a whiff of genuine interest." "Not a glance, a pause or a 'how-do-you-do?'" Emily continued, sitting back. "You've had plenty of glances, you know. Besides, maybe there isn't an Italian equivalent to 'how-do-you-do', anyway. I mean, besides 'come sta?'" "Don't be facetious. It doesn't change the fact that my last hope has just been dashed," she paused to permit a peach-flavored hiccup, "to bits." "Stop being so melodramatic." Jenn glanced around and focused on her friend again. "What do you mean, 'dashed'?" Emily focused her gaze on the dark outline of the railing where the handsome stranger had been. How best to explain that she'd been foolishly pinning her last romantic hopes on this city's charms as their tour of Italy wound down? Weren't Italian men supposed to be positively crawling over the female tourists? She'd been counting on them to help cast Jason Hastings forever out of her memory. Further, she was thoroughly unmoved by the city itself. After the excitement of planning a trip to fabulous Italy, arriving at Fiumincino Airport in Rome had been an anticlimax; and a messy, troublesome anticlimax, at that. The arrival in Venice two weeks later felt somehow lackluster. When they'd gotten off the train and crossed the piazza in front of the station to board a vaporetto to their hotel, Emily had been unimpressed. Even the Basilica di Santa Maria della Salute, which she had always wanted to see, gave her only the dimmest flicker of a thrill. It was there, right in front of her, and it meant nothing – or next to nothing. It might as well have been an amateurish backdrop for a high-school play for all the excitement it stirred within her. Yes, Venice was romantic in the way all the ancient cities of Italy were romantic. On this trip she'd filled countless rolls of film with shuttered windows, colorful landscapes and crumbling, moss-covered stairs. But there were no clandestine embraces, no stolen kisses, no enticing gazes from handsome men meant for her. There were no deeper memories behind the images to give meaning to what she saw. Heck, I probably won't even bother developing most of them. What's the use in a thousand photos of landscapes and buildings, when I've already forgotten half their names? "Earth to Emily." Jenn waved her hand close to Emily's face, drawing her out of her ruminations. "I've had enough." Emily finished her drink and put the empty glass on the ceramic tabletop with a hollow clink. "I'm going back to the hotel." "Why don't you tell me what's really wrong, first?" Jenn leaned closer under the still-open umbrella over the café table. Emily caught another glimpse of the handsome stranger. Once again her throat tightened painfully. He was coming their way. She couldn't bear to witness the scene playing out as it always did, with her watching from the sidelines. Better to give her friend at least a modicum of privacy. "I'm tired, that's all. Besides, I think you've got a date," she said, and walked away. The crowds thinned considerably in the evening hours. Emily had no trouble making her way through the remaining clusters of tourists and residents. She slowed as she followed the winding, narrow alleys to her hotel. The scent of dampness clinging to concrete came and went, depending on the whims of soft breezes meandering their way along with her. She and Jenn saved money by staying further away from the touristy locales. Now Emily could appreciate the distance in a different way as she strolled through the residential areas. The silence closed gently around her and allowed her to think. Enough time had passed for her to feel a bit guilty for how she'd addressed Jenn at the café. It wasn't her friend's fault things hadn't gone well. That was like saying it was Jenn's fault that they were so different. Short and tall, dark and light, round and slim, Em and Jenn. In spite of the differences, they were best friends from the day they met in grade school, when Emily's family had moved to Michigan from Indiana. The girls had grown up together, gone from middle school to college together, and now had undertaken their first international journey together. Jenn always drew all the attention from men, it was true. There was no changing the fact. Besides, what else could be done? Stop being friends because she wasn't getting any of the spotlight? Wouldn't that be totally, utterly selfish? Obnoxious, even? She paused in front of a pasticceria and examined the goods in the window, vaguely considering if she should get something to take back to the hotel. Even at the far end of the picture window from the open door, she smelled the sweet aromas of powdered sugar and flaked dough. And yet, there was little temptation to buy a sack full of pastries – with her virtually non-existent Italian, who knew what she'd actually end up buying? The idea of consoling herself in stereotypical fat-girl style, while Jenn doubtless would have the handsome stranger up for a different sort of nightcap, was even more depressing. She tried to allow herself to imagine stopping their friendship cold, and how it would make her feel to do so. A sudden sense of emptiness shook her at the thought. No, it really was unthinkable. Sure, it was possible to give up her best friend, but what would be the point? Why cut off the one real friend she'd had in her whole life? Why give up the one person she'd been able to open up to after her father died and Jason had turned out to be such a jerk? Just to spare herself the occasional sense of rejection from strangers? "This, too, shall pass," she said under her breath to her reflection in the pasticceria window, and imagined Jenn admonishing her melodrama again. She resumed walking, turned a corner and found herself in Campo Santa Marina, her hotel tucked away in one corner. She rang the bell, pushed open the door when the buzzer sounded and trudged up the stairs to the front desk. The receptionist on duty was a young man around her own age. He barely glanced in her direction after he'd verified her ID with her room information. With an air of indifference, he handed over the heavy brass key attached to a burnished wooden block. She ran her thumb over the number engraved in the wood, the edges of it polished smooth by countless hands over the years. "Buonasera," Emily said, making her best attempt at Italian with one of the few words she felt comfortable using. "Bonaséra," the receptionist mumbled, never taking his eyes off the television and the scantily-clad girls dancing across the screen. Same as always, Emily thought, resisting her urge to wave her hands in front of his face with a sarcastic "Hello...?" Instead, she rolled her eyes then toyed with her key as she walked along the narrow hallway to her room. After showering until the water had gone tepid, she dressed in fresh pajamas and got into bed to find a lump under her pillow. She slid one hand tentatively beneath and fished out a collection of romantic short stories, no doubt left there by Jenn that evening while Emily freshened up before dinner. She thumbed through the well-worn pages and then set the book aside on top of the bedclothes. Instead, she picked up her much battered and beloved copy of The Master and Margarita from where she'd left it on the nightstand. Jenn had spent most of their flight from the US teasing and entreating her to read something different. "Nothing like a little light reading, eh? Russian literature? Why not a book about Italy?" "I'll be in Italy," Emily answered. "Give up and give in to Italia!" Jenn cried, over-enunciating the last word in a feigned Italian accent. "Have an adventure! At the very least, why not read something that will set the mood for you? Like a guidebook or something?" Remembering, Emily shook her head, smiling a little, even though the exchange on the plane and her friend's relentless enthusiasm had been exhausting. Emily picked up Jenn's book and held it up to the light from the bedside lamp. Inexplicably, Jason's face flashed through her memory. "Why not, you ask?" she asked with a sour twist of her lips, then tossed Jenn's book toward the desk. "Because that book is full of crap." _ Available in paperback and e-book.